The medial collateral knee ligament is located on the inside of the knee. It connects the side of the thigh bone (femur) to the side of the shin bone (tibia). The injury usually occurs as a result of a large external force on the knee. 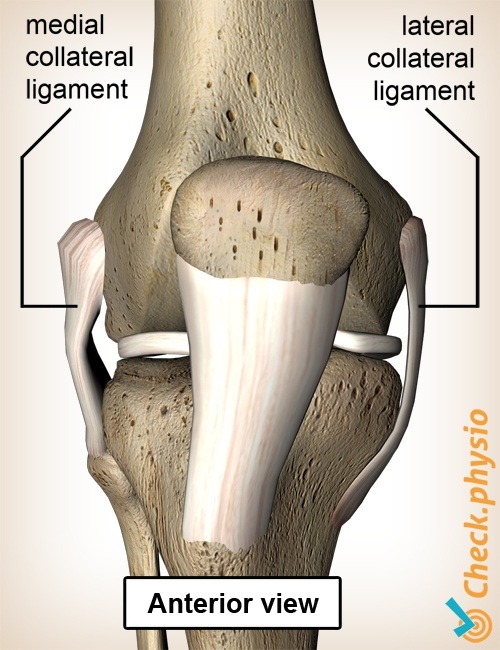 The collateral knee ligaments are often confused with the cruciate ligaments. The medial collateral knee ligaments are located outside of the kneejoint but on the inside of your knee (medial). The cruciate ligaments are located inside of the kneejoint. The most important function of the medial knee ligament is to prevent an extreme valgus position (knocking of the knees) of the knee joint. This means that the medial knee ligament prevents the knee joint from adopting an exaggerated X position. If the knee ligament is stretched too far, it can tear partially or completely. As the medial meniscus is connected to the medial collateral knee ligament, both structures can be affected following a trauma (injury or fall). Injury to the medial collateral knee ligament often occurs on the sportsfield during a block tackle. The knee is hit on the outside, causing the medial collateral knee ligament be stretched due to excessive force. This can cause tearing/rupture. The symptoms can also occur during a fall. Skiing is notorious for medial collateral ligament injuries when you fall and twist the knee simultatiously. Skidding or falling from a bicycle can also cause damage to the medial collateral knee ligament. The way in which a person falls determines whether the knee ligament is stretched or not. The knee will feel stiff and painful. 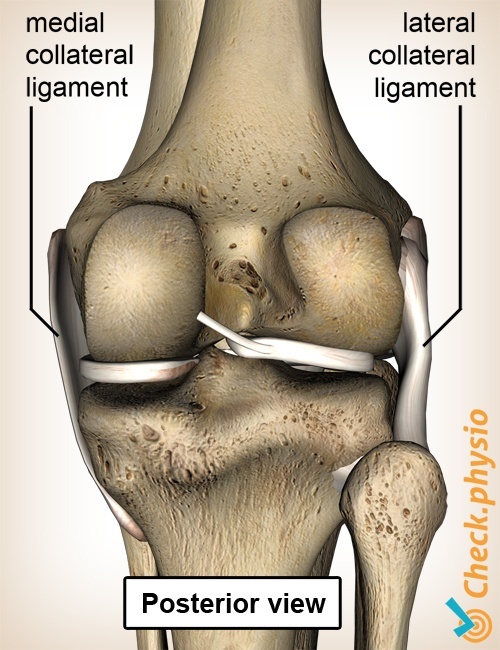 The pain is located on the inside of the knee at the level of the medial collateral knee ligament. The pain can be provoked by pressing on the knee ligament or by stretching it. The knee feels unstable and this can be accompanied by swelling. During the examination, the location of the symptoms will be examined and the moment at which the injury occurred will be discussed. The ligament can be stretched to confirm any injury. A completely ruptured knee ligament will likely heal after a period of 6 weeks of immobilisation with a cast or splint. Physiotherapy can help in the case of a ligament that is only partially ruptured. A surgical procedure is rarely necessary. If the patient experiences problems whilst exercising or performing daily activities, a knee brace can offer support for the weakened ligament and can prevent the symptoms from becoming worse.